Welcome to Kompyte, we’re glad to have you here and we can’t wait for you to get started. I want to familiarize you with the Kompyte platform so you can begin analyzing data right away. On the left you have Kompyte’s main menu. Kompyte's Dashboard is the first thing you see when you login to the platform. Think of this as your competitive intelligence command center! From this single page, you'll get an overview of each element of Kompyte, and therefore, a glimpse of everything that's going on in your market. This is your inbox for everything Kompyte detects on your competitors' web pages. We recommend you sort through this everyday and make notes or tag updates you’d like to take action on. 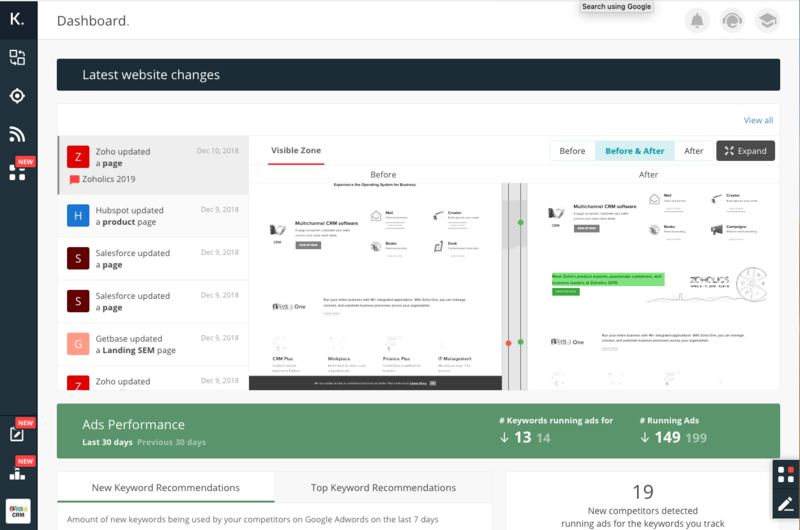 In this section you can view all your competitors Ads as well as the keywords they are targeting and gauge your company’s SEO & Ad performance against theirs. Here you’ll be able to view all your competitors blog and social posts as well as analyze their engagement and gauge your company’s performance against theirs. Sales Enablement section lets you organize and compare your product versus the market and analyze the data you’ve collected. From this section, you can also create professional sales Battle Cards. The reports are completely customizable and let you assess the competition using any metrics you establish. In this section you'll create all your reports as well as see and edit all your reports. Competitors contains all the information related to your competitive space. From here you can change the name of your account, see which competitors and social profiles you’re already tracking, add new competitors, check out suggested companies to track based on your keywords, remove competitors or compare your competitiveness. Now that you’re familiar with the Kompyte interface you can head over to Kompyte Academy to learn how to get the intel you need and learn tips to enhance your competitive intelligence strategy.